Halfvergaan Ontwaakt, unsurprisingly, contains the material from Gelderse Drek tucked inside 32 more minutes of music. I usually do not begrudge bands who repeat releases if it was from a demo and especially if it causes this much excitement. The two songs which sparked interest is fully inflamed as Wederganger’s melancholic horrors are unraveled across dark wooden floors. 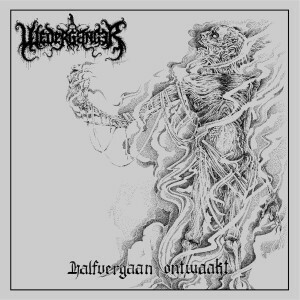 Songs like “Dodendans” do not even need to include harsh vocals to have the weight of eternity at its side. Halfvergaan Ontwaakt goes far beyond vocal gimmick and creates something unnerving and cohesive. Even the instances of the piano interlude “Schimmenspel” resonates deep within the later half of the record giving the structure a haunted sensibility. If I sound moved by this record it is only a year of patiently waiting for a record and then having a wish fulfilled. I predicted and theorized what a full length using the clean/harsh vocals template would sound like through an entire full length. While I was partially right, Wederganger picks up the rest and makes it astounding and one of the more memorable records of the years. Maybe this excitement will wear off in a few months but for now everything is dark with clouds of insects.